Although Tom Dale’s I infinite is performed on the stage at The Place, the immersive nature of its digital technology does not fit well with the model of a conventional theatre. To present it here requires the adaptation of the stage to a white box space and its public bar area to an antechamber in which we are asked to leave our bags, jackets and shoes and to don a loose grey kimono-like jacket; the traditional ritual of attending a theatre performance is subverted. Once inside the space there is no conventional seating but a limited number of white benches or low plinths, some of which, we are told, will be used by the dancer, Jemima Brown. Monitors are present to direct the audience flow when needed. There is no front, no fixed perspective from which to view the performance so those who don’t have a seat are encouraged to wander around the space, stand still, sit, crouch or lie down; leaning against the stretched fabric walls is not advised. Once the performance is under way, however, all the preparations make sense; the exquisite atmosphere video artist Barret Hodgson creates with light and projections around Brown can only work with these kinds of parameters. Dale and Hodgson seem to be spearheading a form of theatrical environment that requires something more like a gallery space to house it where audiences will be accustomed to the all-consuming aesthetic such an immersive experience demands. Until then, touring something like I infinite in conventional theatres will always appear to be the future adapting itself to an antediluvian present. Dale and Hodgson have been involved in this kind of work for some time. Five years ago I saw Refugees of the Septic Heart that Dale choreographed and for which Hodgson designed the projections alongside a lighting designer, a set designer, six dancers, music and text. The complex overlapping of creative inputs proved less cumulative than distracting, but it might have been the effect of experimenting with digital technology in a conventional theatre setting. With I infinite the digital inputs have been set free of the proscenium stage and the performative elements have been reduced to the essentials of light, sound and movement. Dales’s extended choreographic solo for Brown gives the performance the texture of a dance work but its true subject is the relationship between movement and digital technology, not as equal constituent elements but as a demonstration of the latter’s ‘efforts to perfect itself as it constantly tries to re-create or reproduce nature.’ Brown’s role thus appears subservient to the digital evocation of light and space in setting up a neat and vital distinction between the finite digital technology and infinite human expression. 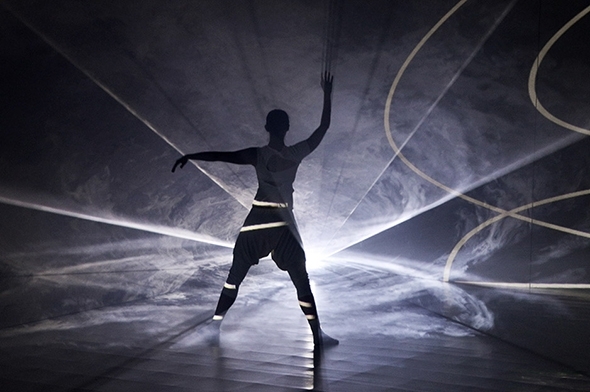 Paradoxically inside the white box space the visual effect of the digital light patterns, especially in conjunction with haze, conveys an uncanny sense of infinity whereas Brown’s body suggests a finite landscape within it. At one point she disappears below the horizontal plane of light/haze and we are looking out on the universe from the top of a mountain. Even if the audience all around is implicated figuratively in the action, Brown’s smooth and articulate dynamic is indispensable as a contrasting focus of our attention, but as a display of possibilities it is Hodgson’s digital sleight of hand that makes I infinite memorable. Dale and Hodgson have evolved their creative venture as a vivid demonstration of the possibilities such a carefully controlled scenographic environment can offer, but in terms of a theatrical experience there is still some progress to be made on a choreographic vision to match it. 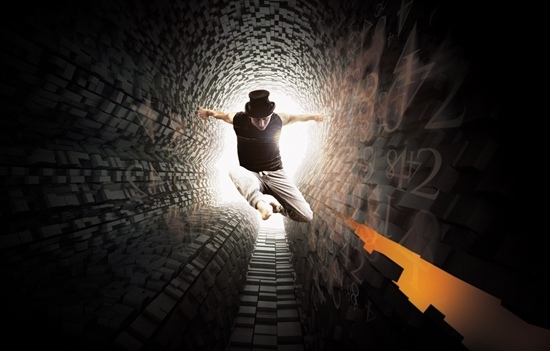 Septic hearts, refugees, apocalyptic overtones and the universe; there’s enough here for a university course in philosophy but Tom Dale packs it all into a single performance of dance and you don’t need a student loan to get a ticket. Dance collaborations with other arts disciplines have been around for a long time: narrative dance has a particular affinity for sets and costumes and a musical score. Dale’s artistic vision is no different, though he updates the media to electronic music and the digital arts. He also employs Rick Holland as creative consultant and dramaturge, for the massed forces in Refugees of the Septic Heart are considerable: the music of Sam Shackleton, projections by Barret Hodgson, lighting design by Liam Fahey, sets and costumes by Kate Unwin, and text by Vengeance Tenfold form an all-engulfing environment for a group of six dancers. For the most part Dale’s choreography manages to stand out from all this, though the dancers have strong competition. It is one of the drawbacks of projections that the more arresting they are, the more focus is drawn away from the dancers, and the more arresting the dancers are, the more focus is drawn away from the projections. Once the curtain opens on Swan Lake, you barely notice the sets, but here you can’t take in all the visual elements at the same time because they haven’t quite learned the manners of serving one another; they are more like siblings with a secret rivalry who are seen together in public but keep to their separate rooms at home. It is the same with Shackleton’s music and the texts by Tenfold: impossible to hear both clearly at the same time, which begs the question, why add a layer of text at all? It may be relevant, but if it can’t be heard, it would perhaps be better to print it in the program. Shackleton’s music has been described as ‘brooding atmospheres, intricate lattices of percussion and warm, embracing sub-bass lines’ and its driving force derives in part from its being played at high volume in a club atmosphere. In its theatre setting, the score for Refugees of the Septic Heart is not all dance music; there are sections of landscaping as well, but as one layer among many in the work, its complexity absorbs a considerable amount of energy and density. Taking place on the fringes of society, the set resembles a small cove enclosing a tiny beach; the dancers climb over the geometrically shaped rocks for their entrances and exits, and they dance on the sand. This and the reptilian infighting and oppression in the choreography makes me think of Lord of the Flies, though this ‘island’ is more of a refuge on the outskirts of a city whose glinting skyscrapers we see in some of the projections. The dancers work incredibly hard with the spatial precision and timing that comes with endless rehearsal and not a few bruises. The costumes, however, tend to distract rather than enhance the figures: too much flapping about of pseudo rags on the one hand and too many costume changes on the other. An isolated, apocalyptic group with a wardrobe? Barrett’s projections range from the galactic to the domestic, from a depiction of the universe of stars to a clock winding backwards, from arcane mandalas to media clips. The set as well as the costumes become the material on which the images are projected, so they move on different planes. Surprisingly for light, this layer, too, takes up a disproportionate amount of space. The concept of Fahey’s lighting for a Christmas nativity at a donkey sanctuary begins to appear attractive. The dancers — four men and two women — are the core of the work. Their relationship is not defined, but they clearly know each other. Dale suggests they are the refugees of the title, a loose collective of like-minded souls escaping a septic, heartless society to keep the creative fires alight. Dale does not develop characters so much as fast-paced, physical relationships that give the impression of emotionless ties between the dancers that are nevertheless tightly defined by their movement. One opportunity for a warmer, almost comic exchange is between Ariadna Gironès Mata and Joshua Smith as they point at each other and out into the audience as if to ascribe some fault or condemnation. Another is Hugh Stainer as messianic jester carrying a worn piece of cardboard on which is written ‘Time’s Up’ which he repeatedly shows to John Ross, who rejects it. But these instances are isolated, with neither precedent nor development, and thus take on the quality of the absurd, which may or may not be deliberate. Despite its initial promise, philosophy is perhaps the weakest layer in Refugees of the Septic Heart, yet it offers in its encouragement of creative independence in the face of an apocalyptic vision the one thread that can link all the layers. Its important voice, however, is overpowered by the others, one layer on top of the other, each with its separate identity that you may like (and grasp on to) or not (and reject). Perhaps it comes down to a question of time and resources: with such an ambitious task, eight weeks in production including choreography is insufficient to do justice to Dale’s integrated concept. Finding that balance and completion is to come. Refugees of the Septic Heart unite! As with the popular evolution of wine, dance has gone from its traditional forms through international styles to ethnic cross-fertilization. Hetain Patel’s Be Like Water is such a delight that it reminds me of a recent comment by a wine writer who said that thirty years ago the idea of the best-tasting burgundy coming from Hungary would have been unthinkable. Be Like Water’s humour and intelligence, conceived as a Bruce Lee-inspired autobiographical fragment by a Bolton-bred first generation Indian video artist and a Taiwanese dancer, make it one of the most refreshing works I have seen in a long time. 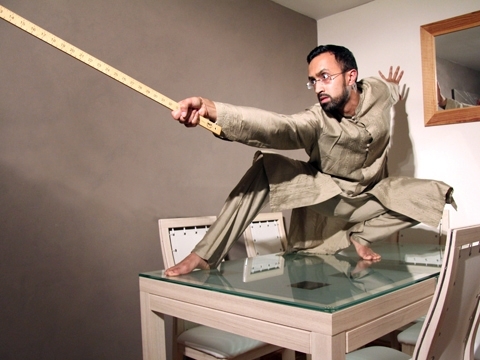 Patel is a visual artist whose video installation To Dance Like Your Dad was included at Dance Umbrella last year. Parts of that installation find their way into Be Like Water, which was originally conceived as a video work but passed through several transformations before emerging as a dance theatre work with a multitude of elements and a deceptively simple path. All credit to Patel and Yuyu Rau for the text, and to Eva Martinez and Michael Pinchbeck for the dramaturgy, seamlessly weaving together a video tour of father Patel’s coach building factory with the son’s superimposed guide to his stage set, Bruce Lee with the erhu, China with Bolton and Kung Fu moves with Rau’s spirited solo of childlike enthusiasm that closes the performance. As varied and beautiful as the individual elements of Be Like Water are, what ultimately holds it all together is the theme, which is contained in the title. In his To Dance Like Your Dad, Patel is clearly in awe of his father, and in Be Like Water he conjures out of the air the words Every now and then in my life I have tried to be like my father. Trying to be someone else has its hazards: as a student Patel adopts a fake Indian accent and grows his hair and moustache like his father which allow him to get a discount in Indian stores but he finds the moustache is so out of proportion to his own face that it makes him forget who or what he is trying to be. In imitating Bruce Lee he ends up in a police station for disorderly behaviour delivering a kick to a dustbin in the street (an action picked up ironically on CCTV). On a residency in China he learns a paragraph of Chinese from a Chinese woman, but discovers that he has picked up his teacher’s inflections (Patel has a particularly acute sense of mimicry) that make him sound to the Chinese like a woman. Throughout the work, Patel uses his self-awareness and humour to reveal these inconsistencies of expression through anecdote and well-conceived video work (with the aid of digital artist, Barret Hodgson). At the beginning he speaks in Chinese — to avoid any assumptions, he says, about his northern accent — and Rau translates into English. He then admits what we have begun to suspect, that he only knows one short paragraph of Chinese that he repeats on all subsequent occasions with varying emphasis while Rau dissembles by delivering a consistent English text. Patel thus wraps himself up in disguises that fool nobody but himself. On the other hand, one senses his father, an Indian immigrant who speaks with a broad Bolton accent, has no need of disguise and is very much himself. Rau reminds us that Bruce Lee found in Kung Fu the only way he could most honestly express himself and Rau herself learned classical ballet as a child in Taiwan but only when she started studying contemporary dance in London did she find her true expression (which makes her final solo dance to erhu accompaniment so poignant). Patel’s moment of realization seems to come as he sits listening to Ling Peng ‘translate’ his Chinese into notes on the erhu. As Ling Peng plays (beautifully), a live projection of her hands on the bow arching across the strings expresses the oneness that exists between musician and instrument. It is as if Patel himself finds his voice in soaking up the influences of his collaborators, in assimilating his own experiences and in reaching his conclusions; he becomes one with his work. Be Like Water has the wisdom of a modern fable, expressed imaginatively and generously, speaking to us all.